Illuzion Rustler VXL Clear Hi-Speed body with wing Discounts Apply ! JCI0042 - Illuzion Rustler VXL Clear Hi-Speed Body with Wing. 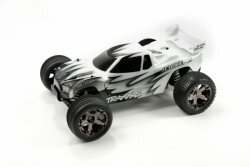 The "Hi-Speed" style is the latest in design for the Traxxas Rustler VXL truck by JConcepts. The Illuzion �Hi-Speed� styling presents a flowing design while incorporating many radical outlets and coves for additional air flow for electrical cooling. The Illuzion - "Hi-Speed" body is also the first to include a separate rear wing with side dams that attaches to the rear of the truck bed for superior fit and finish. Race inspired aggressive styling, Illuzionized cab and cove hood scoop combined with a durable flowing bed design are just some of the features that make the new Illuzion "Hi-Speed" body stand out from the rest.